Last night, as I was walking Dug, it hit me: after a day of forced and unscheduled rest, followed by a regular rest day, all I wanted to do then, at that very moment, was RUN. I have to admit, it was a weird feeling since I generally am a morning runner (save for Tower of Terror 10-Miler and Wine and Dine 1/2, of course) but I decided to wait it out to see if the feeling was still there in the morning – in which case, I’d make the executive decision to extend the scheduled 6 miles to…well, why not 20.13? Note: all italicized statements are meant to be the random thoughts popping into my mind along the course of the run. Mile 1 – Well, hot dang – December and I get to run in a tank top and shorts….this is the life! Oh wait, why am I running a sub-9 pace already? I should be in the 9-10 min range with base-building. Ooops. I think I’ll head out to the trail and decide on mileage later. Mile 2 – Okay…running the trail…out and back…so each mile I run, will mean I’m running at least double that today. Wow, I am so great at math. Mile 3 – So hey, I guess I am doing at least six miles today. Mile 4 – Ah, mile 4. Remember when I ran my first 5K and anything over three miles sounded impossible!? Wow. Mile 5 – Hooray for the water fountain! Grr…remember this dumb thing was broken the last time I ran 16 miles?! Boo. I am pretty sure this is the main reason I did not PR at Space Coast. Okay, maybe not. But at least it’s working today. Yay water. Yay hydration. Mile 6 – Hmm, I am running at least 12 miles today. 12 sounds lame. I gotta run at least 6.5ish so I can get in a half marathon distance, right? I should have brought GU. Oh well. I’ll put some in my belt next time. Mile 7 – Why is it that, with 71 songs on my playlist, some songs play over and over and some never come on? Where the heck is my Thunderstruck?!?!? Oh, wait, there it is. Yay. Mile 8 – Eight….eight…why is this number sticking out!??! Oh yeah, I have run eight marathons! EIGHT FULL MARATHONS. Me, pre-2010, would never believe this. I cannot wait for #9! Mile 9 – I haven’t run this far on this trail ever….can’t stop now! I guess today’s 20 miles. Mile 11 – It’s kinda cool how you cross through, like three cities in a matter of a few miles. This trail is awesome. I love this trail. I love it here. Yay love. Mile 12 – There are a lot of cyclers. Mile 13 – Well, hey there half marathon point! Pretty sweet that it’s sub-2 with minimal effort. How many halves did I run this year, again? Hmm…Tink, Colonial, then that crazy April, with Blue Ridge and Nike…then my first double weekend with Disneyland and Labor Day in Seattle…and who could forget Wine and Dine? I guess that makes seven halves? Yowza! 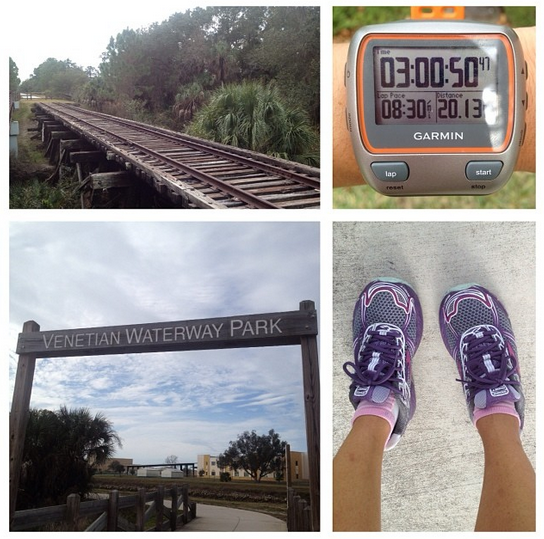 Mile 14 – I am so glad I bought this Garmin. So what if it looks like I am carrying around a computer on my wrist?! I can see the numbers clearly and there’s no new-fangled confusing stuff. Hrm…I sound really old saying this stuff. Oh well, I am gonna own it. Mile 15 – Water station! Hello again, my friend…you are my BFF. Mile 16 – When did it go from warm and pleasant to surface of the sun? Off goes the tank! Thank goodness I wore the longer sports bra today. Oh, hello other water station, time to pour water over my head so I don’t die. Mile 17 – How do I want to start my online coaching stuff? Should I make a new website? Should I just kinda see how it goes at first, then work on sprucing stuff up? Mile 18 – I am getting so freaking hungry. What will I eat when I get back? Ugh, I am covered in so much freaking salt. I am hungry but all food sounds gross. Maybe I will make a smoothie with that Muscle Milk that ZOOMA sent me. Yes, a smoothie sounds amazing right now. What is my goal for ZOOMA? Mile 19 – Recumbent bikes are weird. I wonder if your neck hurts when you ride them. It looks like your neck would hurt. Mile 20 – So….I just realized this: I’ve not run this far in a training run in – um….a really long time. Or something. Wait, other than in a marathon, have I run 20 miles without a bib pinned to me in 2013? Brain scan…um, I don’t think so. This is kind of cool. Hey! 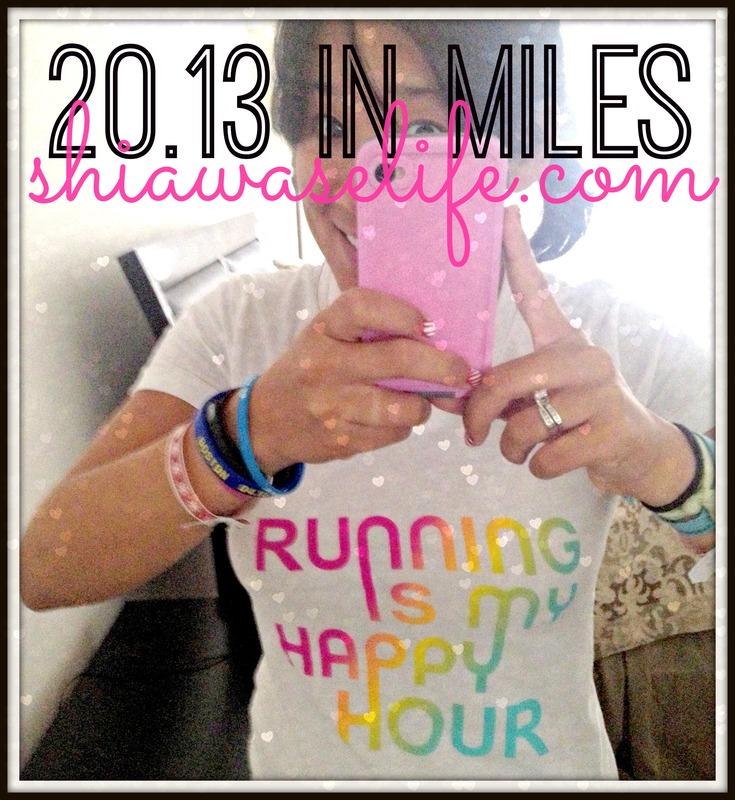 Remember my first 20 mile run? Oh geez, why did I have to remember that? Wait! My second 20 mile run was awesome…though it was technically a race. Who came up with 20 as a standard for long runs anyway? Last .13 – YEAHHHHHHHHHHH VICTORY! Make sure you pause it right at 20.13 – cos it will be all for naught. Or something. Time for a smoothie!! So tell me, how was your year of running? What are your goals for 2014? Wow! I love that idea! Now I want to do 20.13 too! I also love that I’m not the only one thinking about numbers pretty much the whole run (weird because I hate math). Fun! I don’t think I’ve ever run 20 miles on a whim. And yes, I too remember how at one point anything over 3 miles seemed impossible. Look how far we’ve come! For 2014, I’m FINALLY taking down a sub-2 hour marathon. Current PR is 2:00:30. Those 30 seconds are toast. Happy New Year! Yay us! You are gonna take that Sub-2 down!!! This is so cute! I love posts with random thoughts from a run…and I’m glad I’m not the only one who thinks totally random thoughts! And let’s talk about how you are a MACHINE and just went out and ran 20 because you felt like it. ROCKSTAR! 😉 I still hope our paths meet again so we can for real run together someday. I don’t know many people who just wake up and decide “I think I’ll run 20 miles today.” Kudos to you! And I love your random thoughts. I think some of the same things when I’m running.